In a very short time, Anamera has risen to become a trusted resource in the field of classic, premium and sports cars. Collectors obtain valuable market insights by following the offerings appearing on Anamera, and are able to connect with prospective buyers. Event organizers find it easy to reach fans among the millions of annual visitors that are drawn to Anamera by exclusive, first-rate photo story coverage of major automotive gatherings. 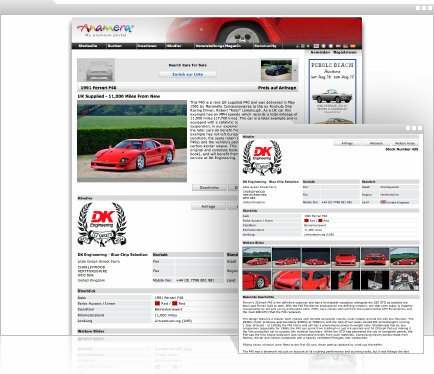 Dealers and auction houses benefit from sophisticated and highly adaptable data exchange technology to automate the submission and timely updating of their stock lists or online auction catalogues. Clubs, user groups and other auto portals rely on Anamera's flexible interface and standard feeds to offer a selective "Mercato" feature on their own web site.